These days it seems that everybody is in the movies. And if you’re not in a movie at the moment, you’re watching them. And if you inhabit director Alex Cox’s filmmaking world, that may really be true. Cox lives in a special place I’d like to call “Edge City.” (That’s also the name of his first student film and later his production company.) Edge City is America reflected in a fun house mirror. The world at large got introduced to Edge City in Repo Man (1984), Cox’s break into the big time and the film he made before Sid and Nancy (1986). There is a dry and surreal humor native to Edge City that I really like. Just about anything can happen there and the laws of probability march to a different drummer. There is a casual crazy fatalism in Cox’s films that is fun to watch. When you are living in a film-fantasy world, dreams are the reality. After all, isn’t Hollywood the Dream Factory? In Edge City people come up to one another on the street and say “Hey, weren’t you in Rio Zombie Shoot Out? I was in that too... third Goth from the left....” And then the conversation dives into a vortex of arcane cinema minutia, bad spaghetti western titles and stunt double’s names. This is one of several running gags in Searchers 2.0, along with SUVs running out of gas and everyone constantly texting on their phones. Searchers 2.0is a treat if you are a film fan, but may leave everyone else scratching their heads wondering “... who are these people?” Well, they are the army of uncredited extras that orbit the further reaches of the Movie Star System, part of an asteroid belt of nonentities that see themselves as lesser planets but are seen by everyone else as just rubble. This is the same territory that Ricky Gervais explored in the first season of his TV show Extras. 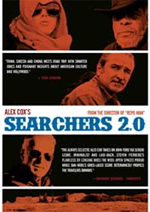 I’ll guess that to an L.A. audience, Searchers 2.0isn’t a movie but a documentary. Mel (Del Zamora) and Fred (Ed Pansulloare) are a couple of scraps of film debris who (like everyone else) have appeared in movies their whole lives. They are both currently out of work and they share a childhood trauma. As child actors/extras they were both brutalized by the evil screenwriter Fritz Frobisher (Sy Richardson). They improbably meet, and discover that their nemesis is going to be appearing at a special screening of an old Frobisher film in, of all places, Monument Valley Arizona, the archetypal John Ford/John Wayne landscape and hence the title Searchers 2.0. Mel and Fred decide to go there and settle their old score with Frobisher. This being Edge City, Mel and Fred have to scam a ride with Mel’s estranged daughter Delilah (Jaclyn Jonet) and the three of them take off for Hollywood’s most mythic cowboy country. Delilah doesn’t know about the revenge aspect, and humor ensues. For Mel and Fred, everything in the Edge City world connects to film and filmmaking one way or another. Even the gas station attendant in the middle of the Arizona desert was once in a movie with Fred. The attendant recognizes Fred as the guy who ruined his budding career and he’s got a life-long grudge against Fred like the one Fred and Mel have against Frobisher. Eventually Mel and Fred find Frobisher at the special screening. Frobisher, who did have some degree of success, is now reduced to hawking souvenir t-shirts, autographs and old screenplay manuscripts to fans. The guys confront Frobisher in a classic spaghetti western three-way shoot-out scene. But instead of bullets, it is a Q&A with Frobisher taking the trivia and Delilah refereeing from a tattered film watchers guide. The Q&A ends with Fred being killed by a golf ball. A golf ball?!... hey, remember this is Edge City. Fred’s burial scene is wonderful. Monument Valley under a fresh cover of snow makes for a setting that would break the back of a real world film production but in Edge City, mystic visions are a dime a dozen. Then in a turn of events I can not reveal, Searchers 2.0goes into a hyperdrive for an ending right out of Repo Man. It’s difficult not to hold Cox’s work up to Repo Man and it would be easy to downgrade Searchers 2.0because it’s not another Repo Man.That’s unfair to him and Searchers 2.0. Maybe it would have been better if Repo Man was what it was originally supposed to be: a loose, fast, and rough small film; then Searchers 2.0would fit in as part of Cox’s work. After seeing Searchers 2.0, I really want to see Cox’s next film, Repo Chick. Edge City here I come, right back where we started from. There are some worthwhile extras on the DVD release. With The Making of Searchers 2.0, home movies have never been better. There is also an audio Commentary by Alex Cox, composer Dan Wool and sound designer Richard Beggs. The imagery in Searchers 2.0 is so good, I kept forgetting I was supposed to be watching a “microfeature.” The score is a clever riff on spaghetti western sound tracks. Definitely watch this one another time with the commentary track on. Because it’s a film about filmmaking, hearing the director, the composer and the sound designer talking about the film almost makes it Searchers 3.0. It’s one of the best commentary tracks I’ve heard in a while.